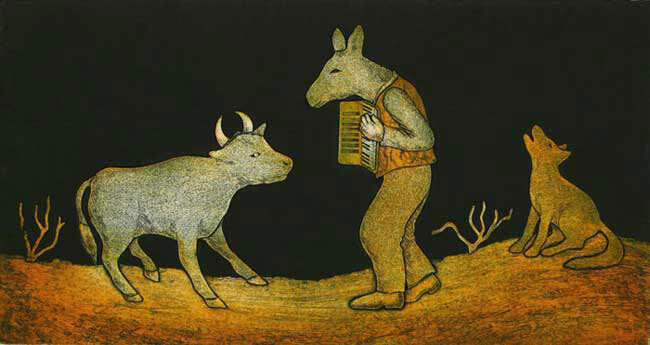 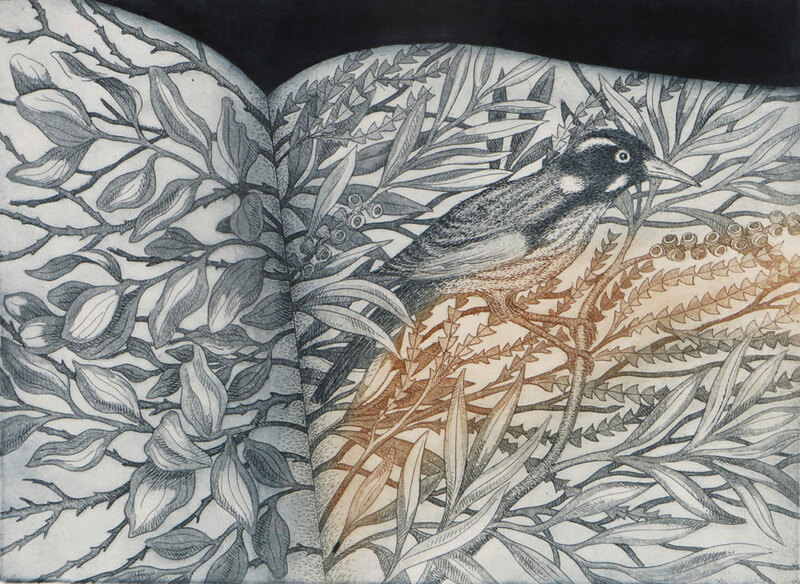 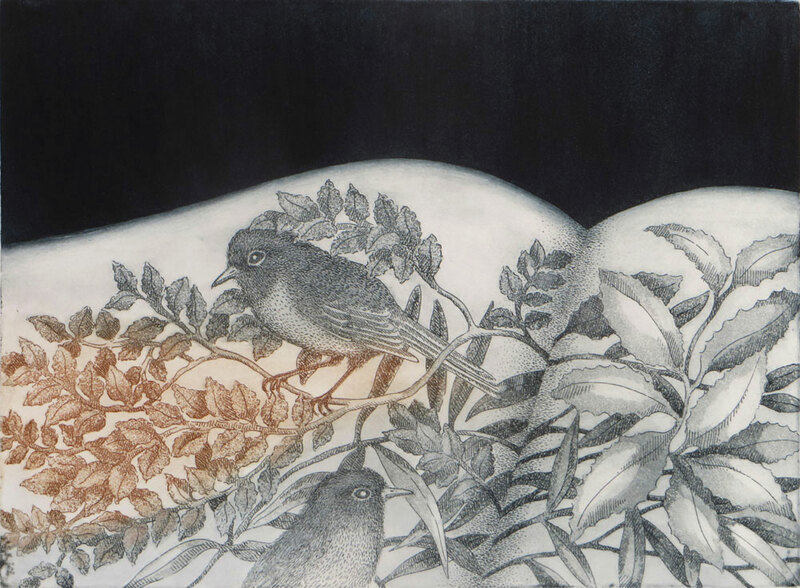 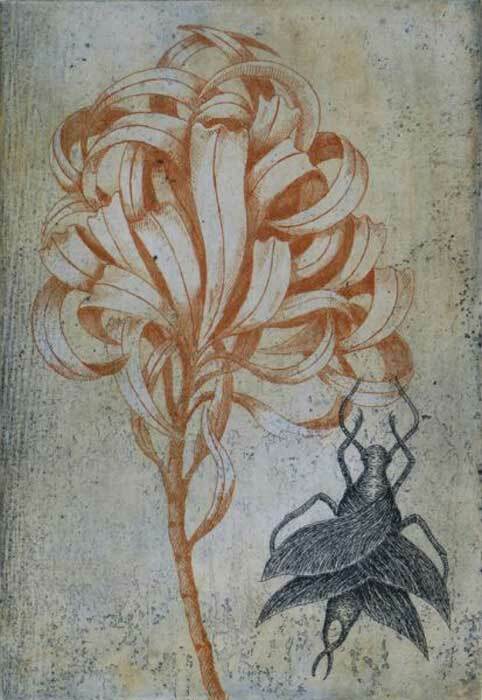 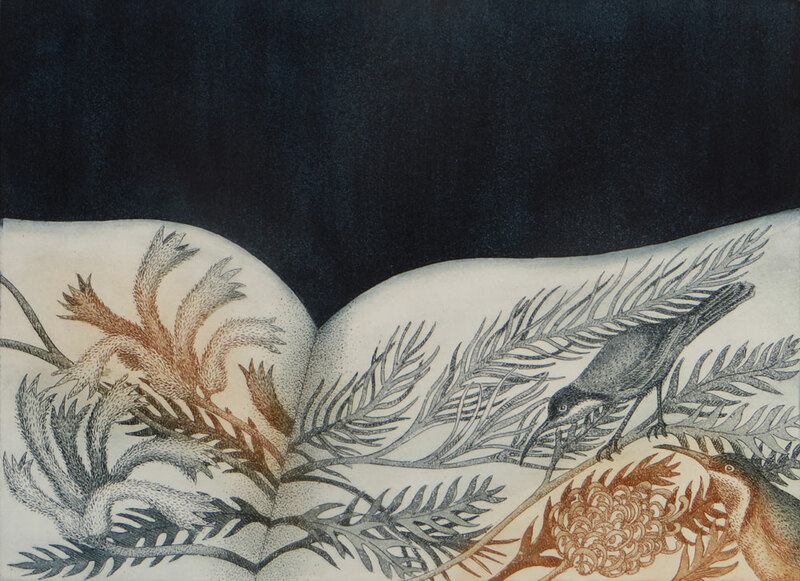 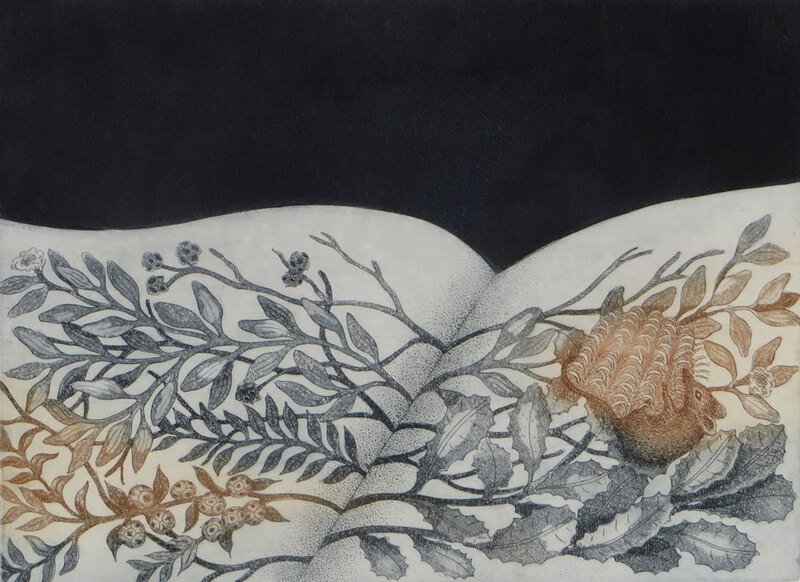 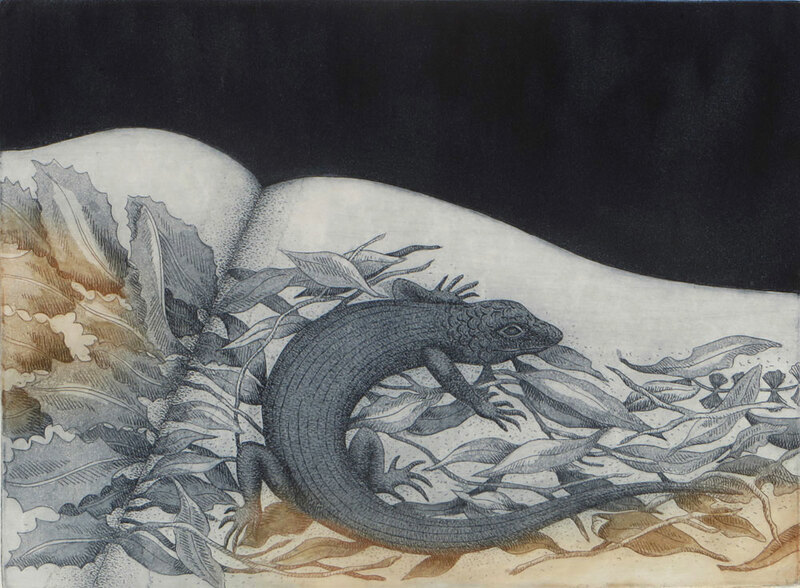 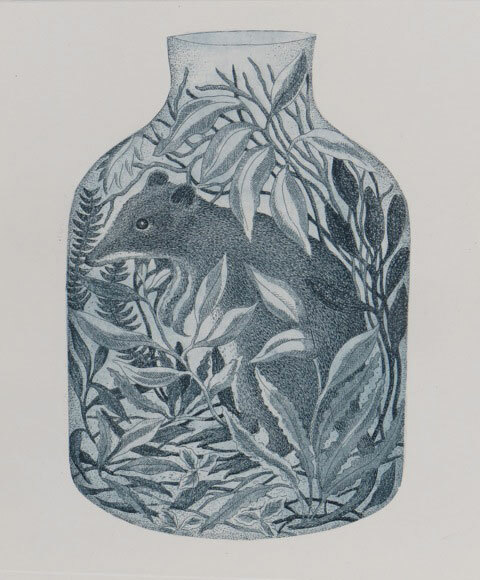 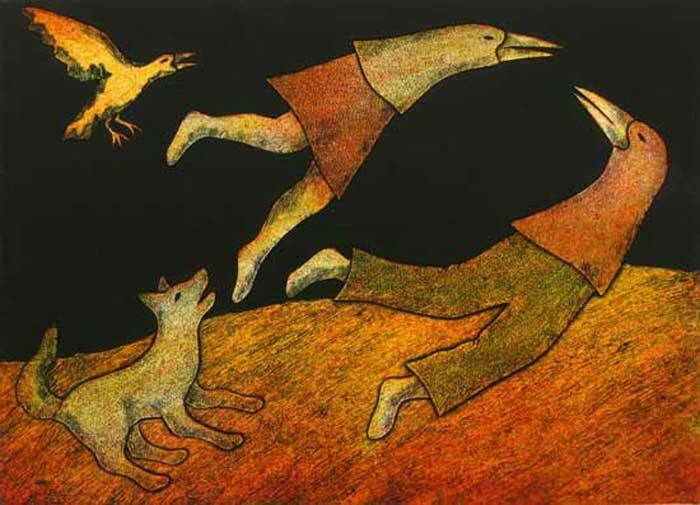 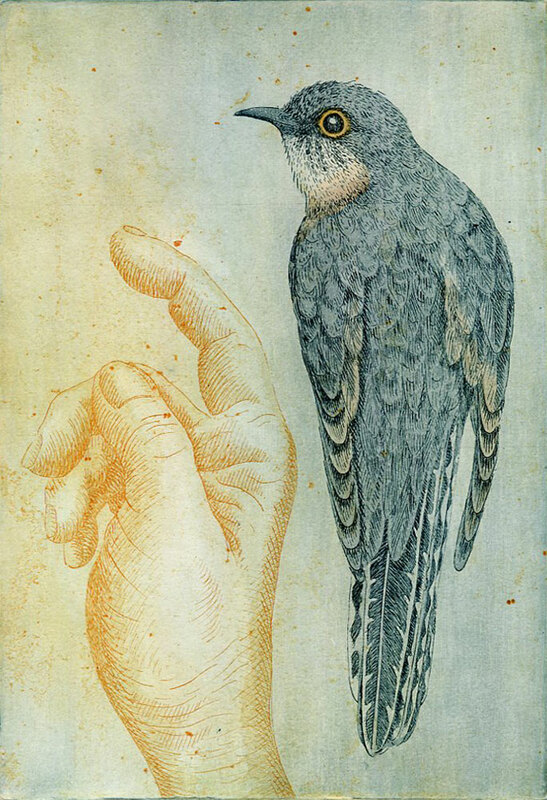 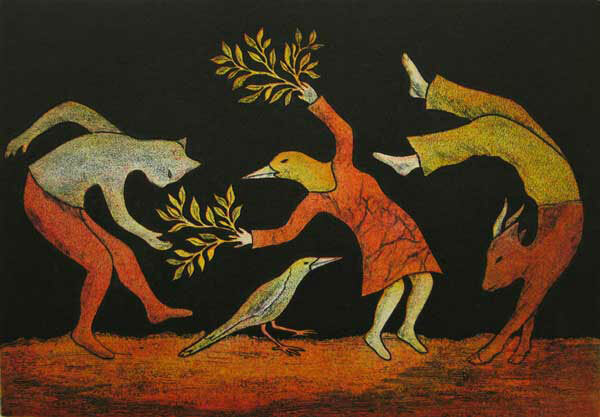 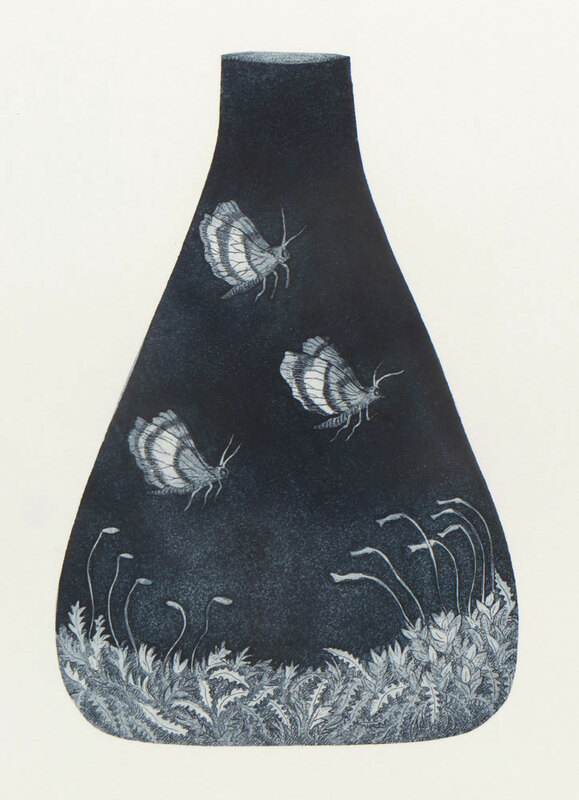 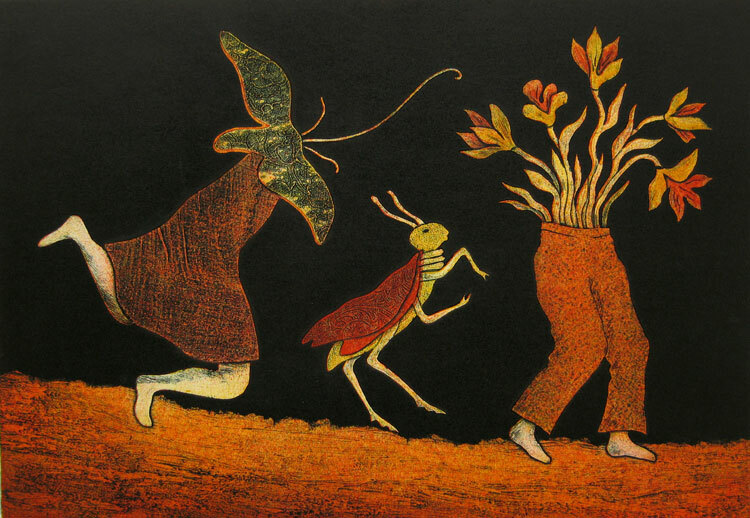 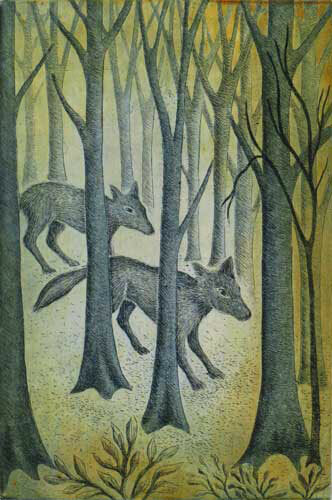 Kati Thamo is a highly skilled printmaker with an imagination that fills her work with allegory and visual ambiguity. 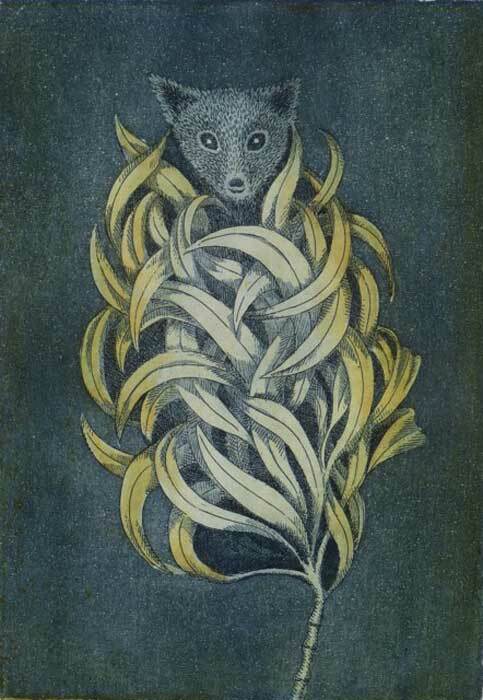 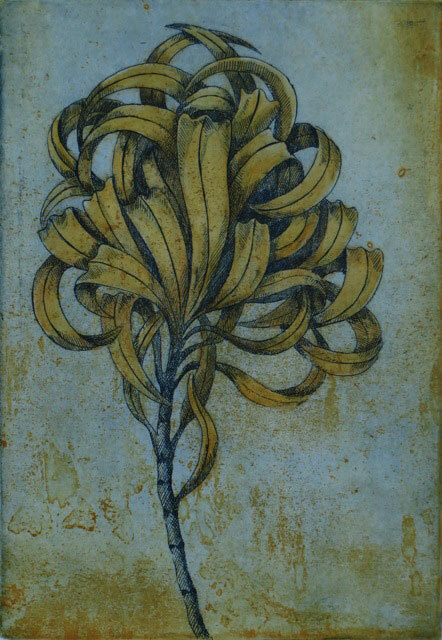 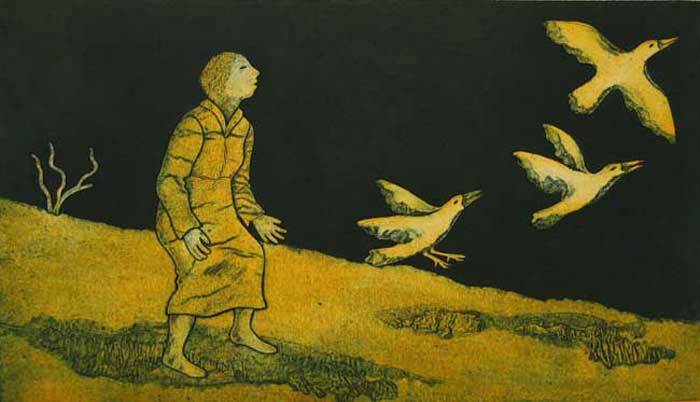 A superb colourist, her prints are easily recognisable with a richness of tone and unusual textural quality. 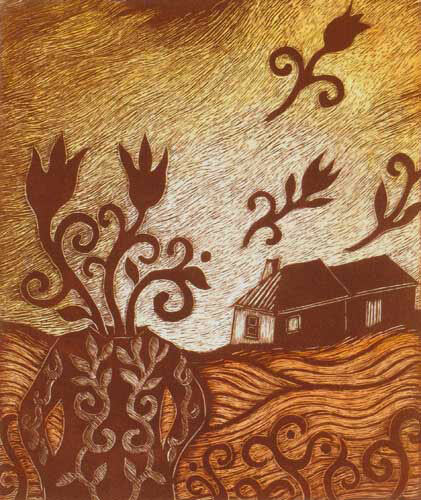 Kati says of her work, “my art is a form of storytelling, with a strong narrative intent evident in my work. 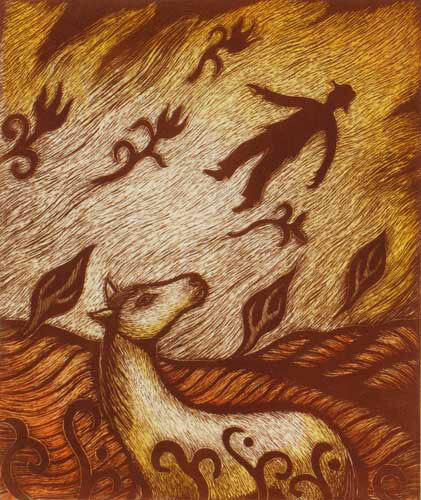 The stories which fuel my images are often autobiographical, and aspects of my Hungarian background emerge in my work. 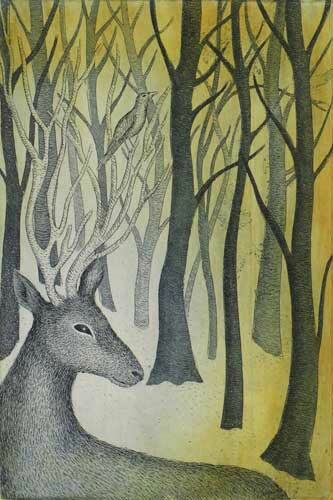 Animals appear frequently in my art both by themselves and in association with people. 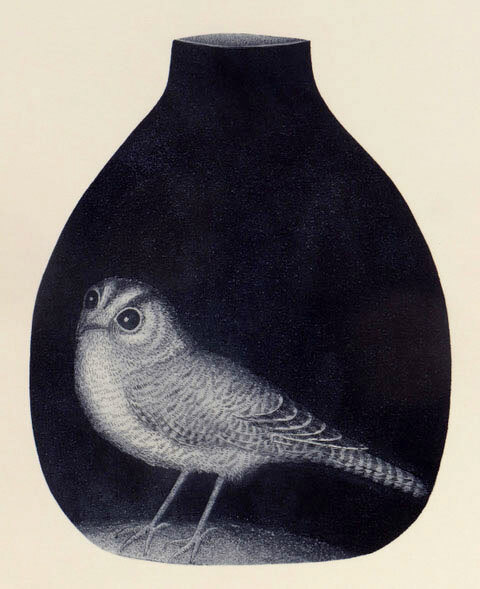 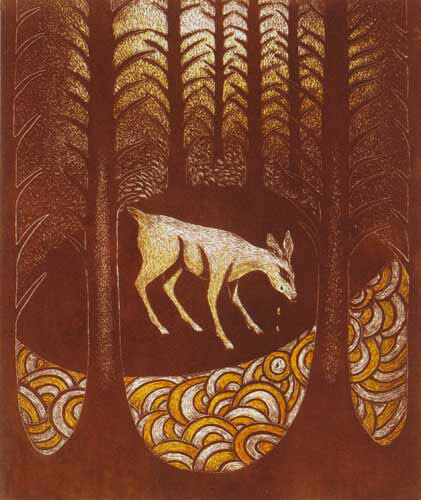 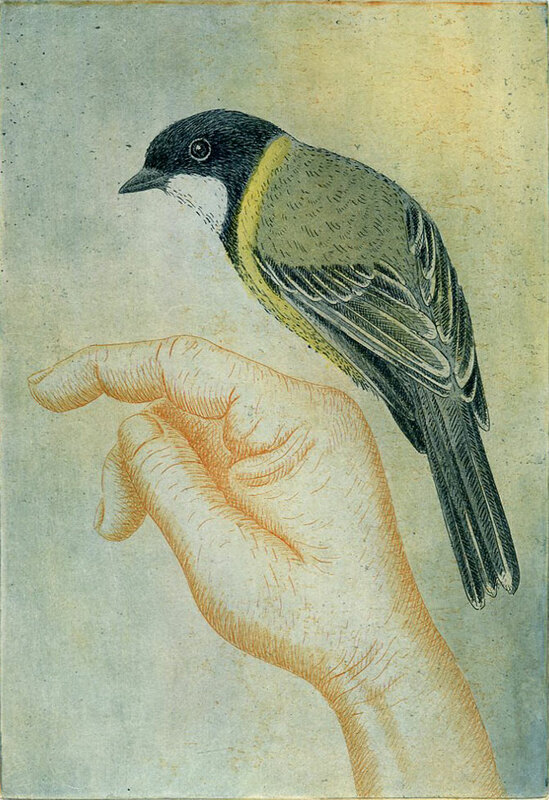 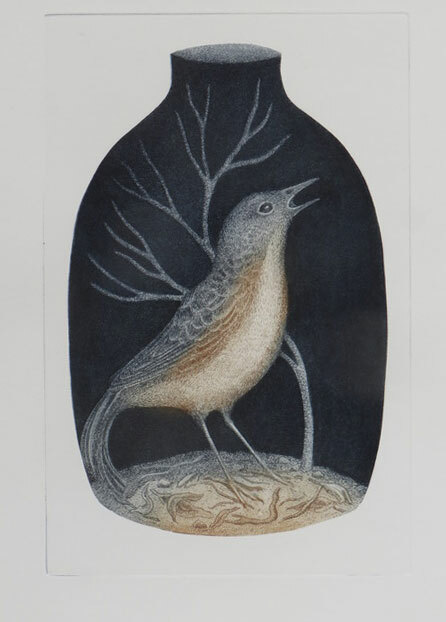 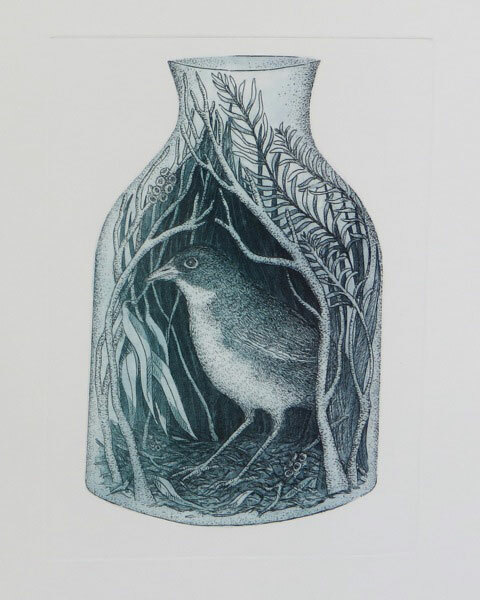 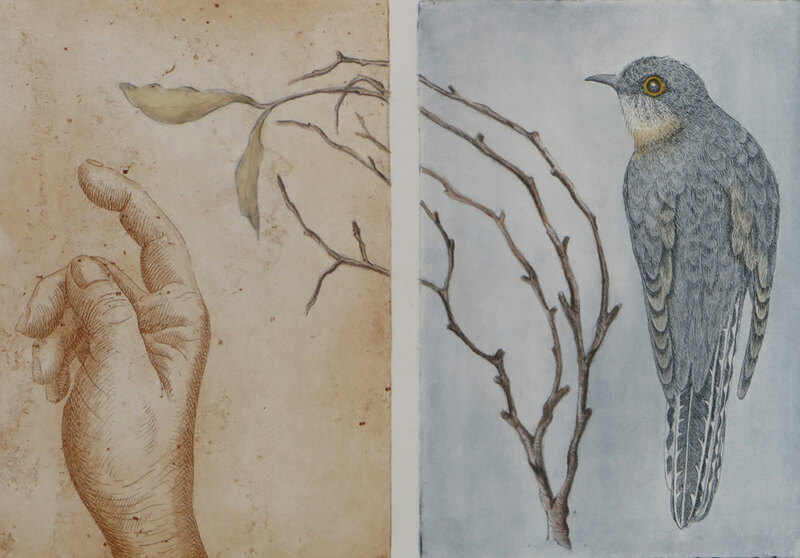 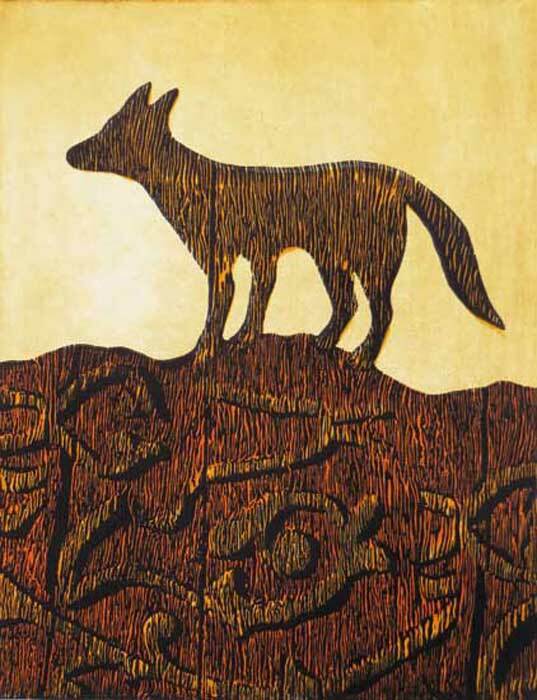 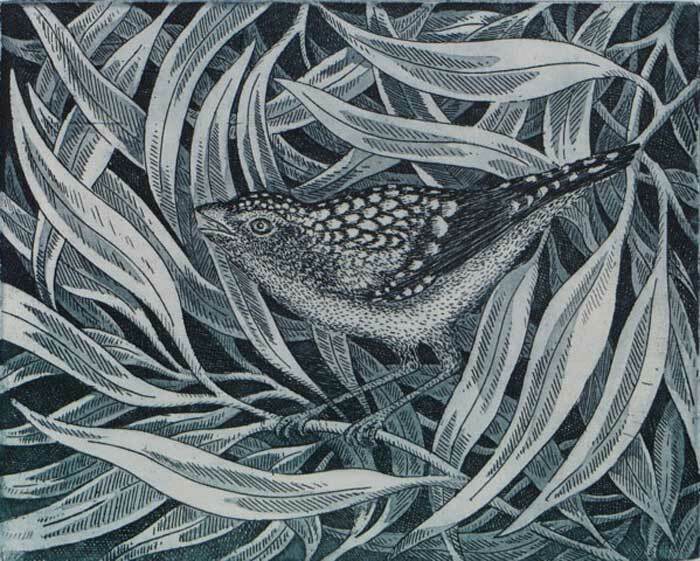 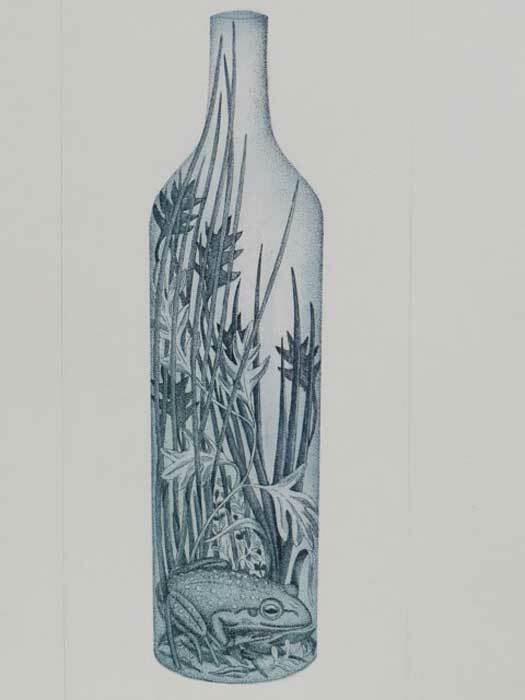 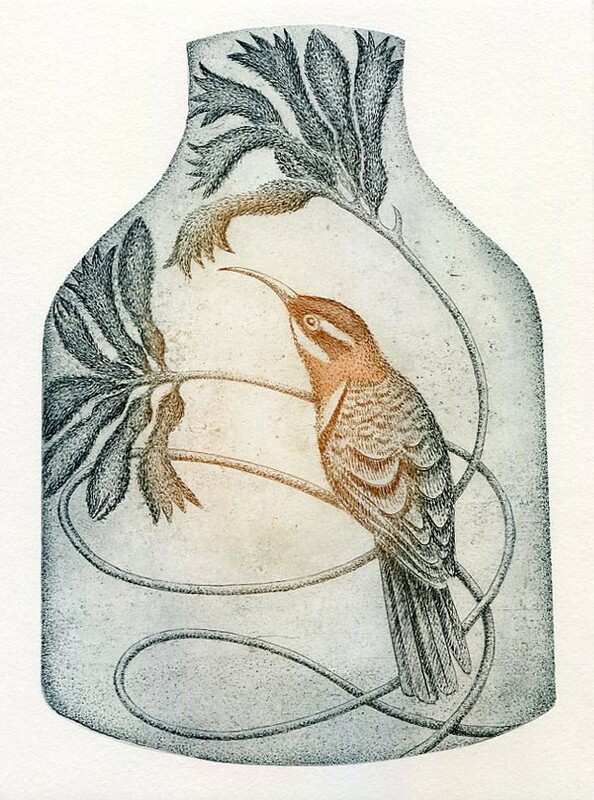 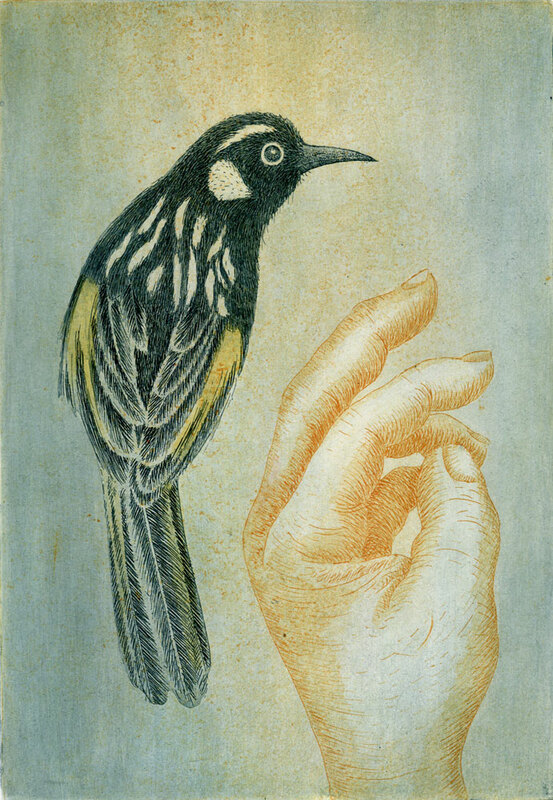 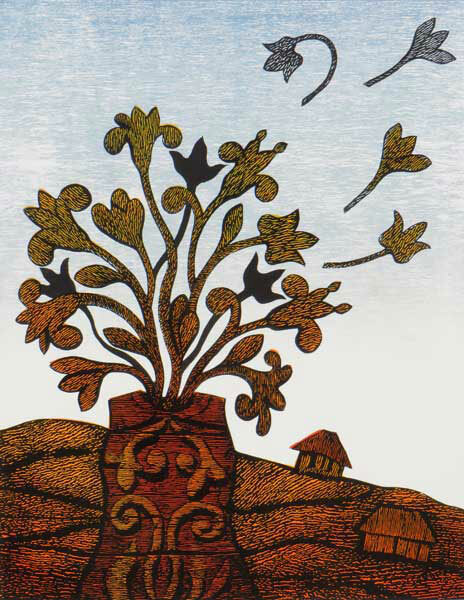 They are used for their own inherent qualities and also metaphorically to represent aspects of human nature and behaviour.” Most of Kati’s work is in print media, using etching, linocut and collagraph techniques. 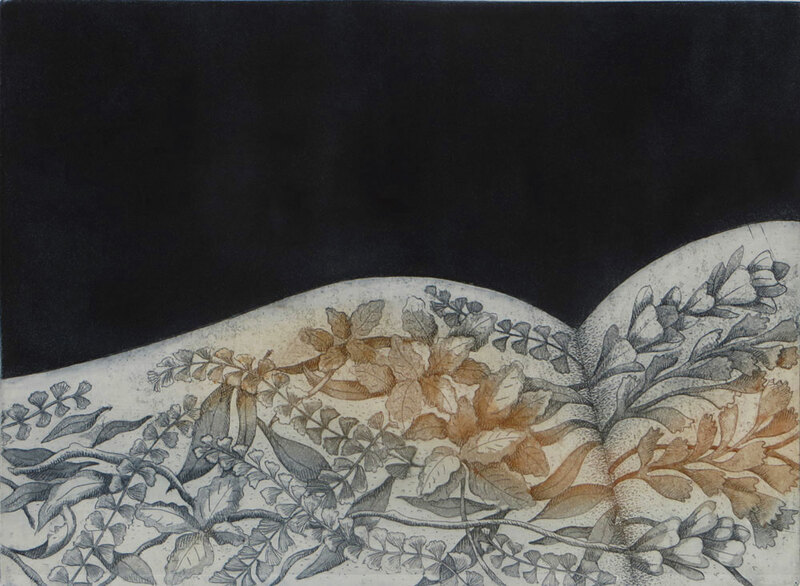 Recently, she has been especially drawn to the embossing effects and intense colouration of collagraphs. 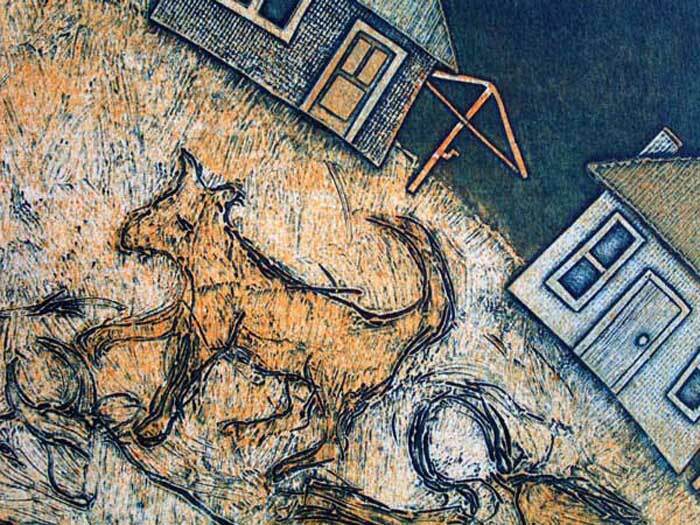 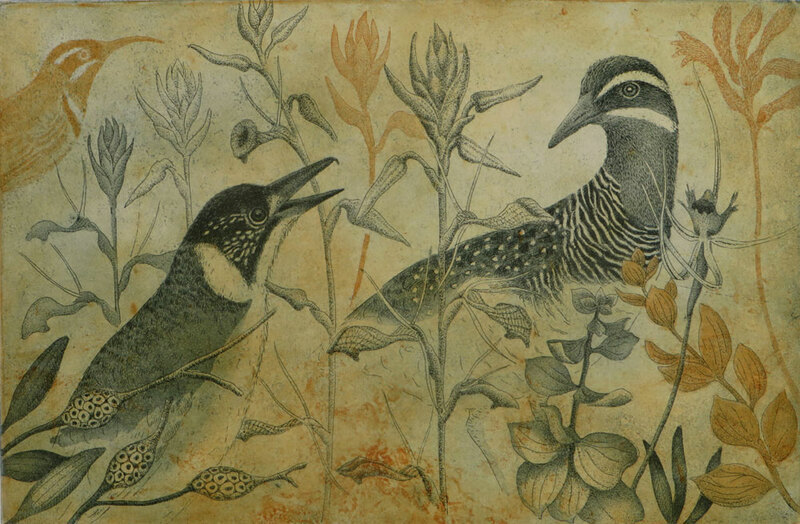 A form of intaglio and relief printing, these richly textural prints are achieved by way of collaging a variety of materials, especially fabric, onto a cardboard base plate. 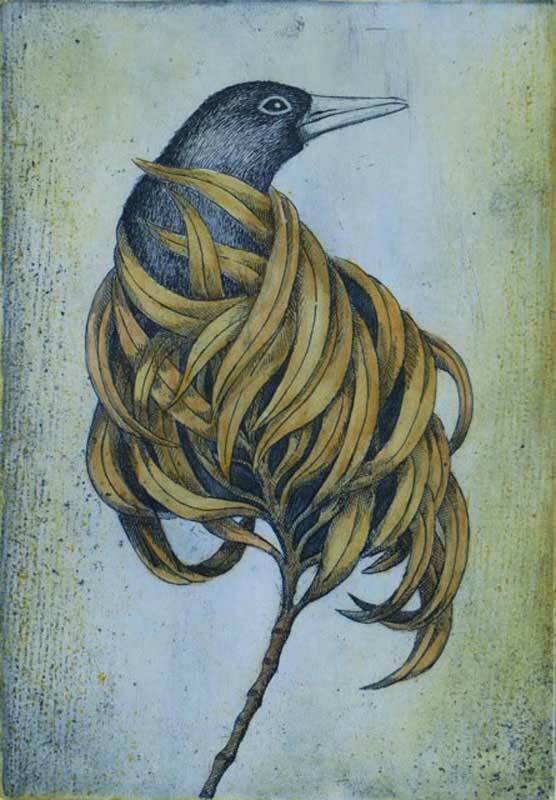 Kati has also ventured into sculptures of cast bronze, bringing her allegorical characters into the third dimension. 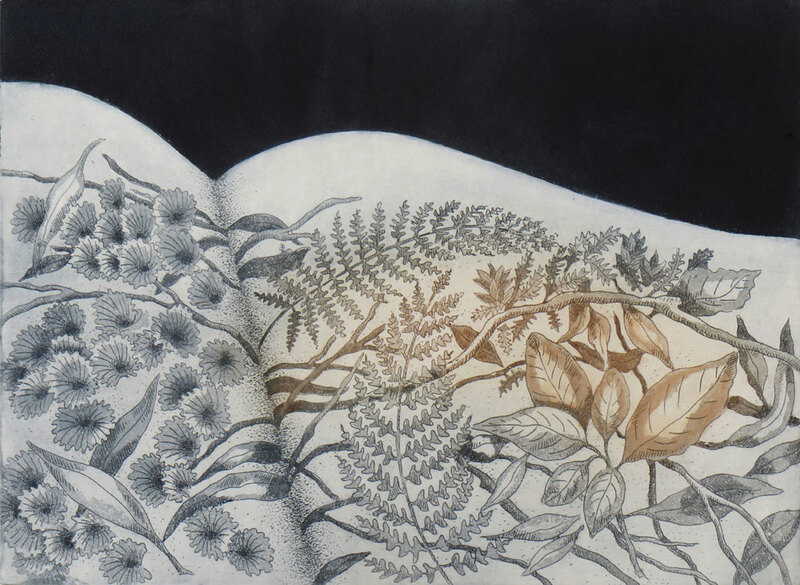 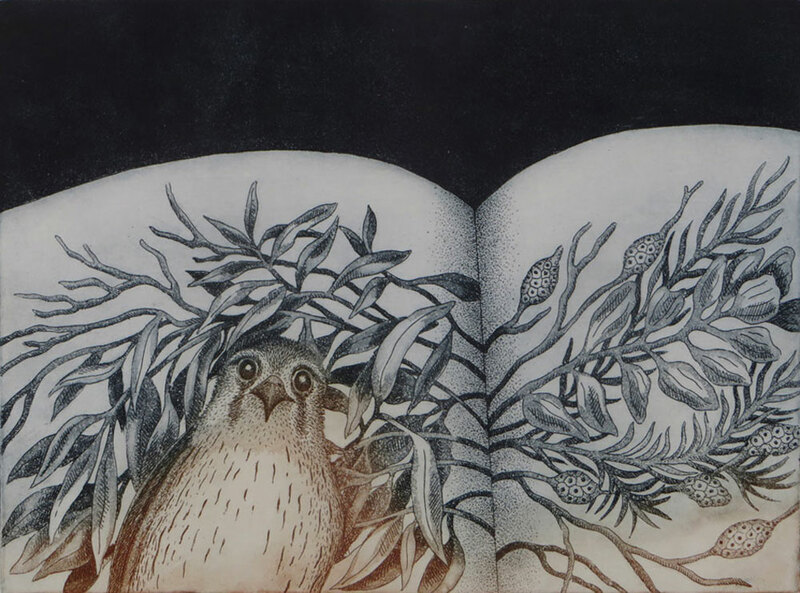 A graduate of both Edith Cowan University, Perth, and the University of Tasmania, Kati has lectured in Visual Art at Great Southern Regional College, Albany, WA, and in Printmaking at Edith Cowan University. 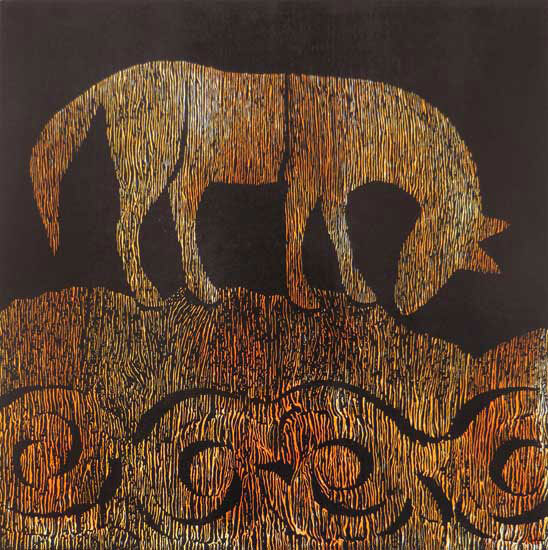 She has been the recipient of many awards including the 2003 Major Open Award at the Western Australian Printmedia Awards, the Gallery 500 Award at the Albany Art Prize in 2004 and the Open Award in the Albany Art Prize in 2007. 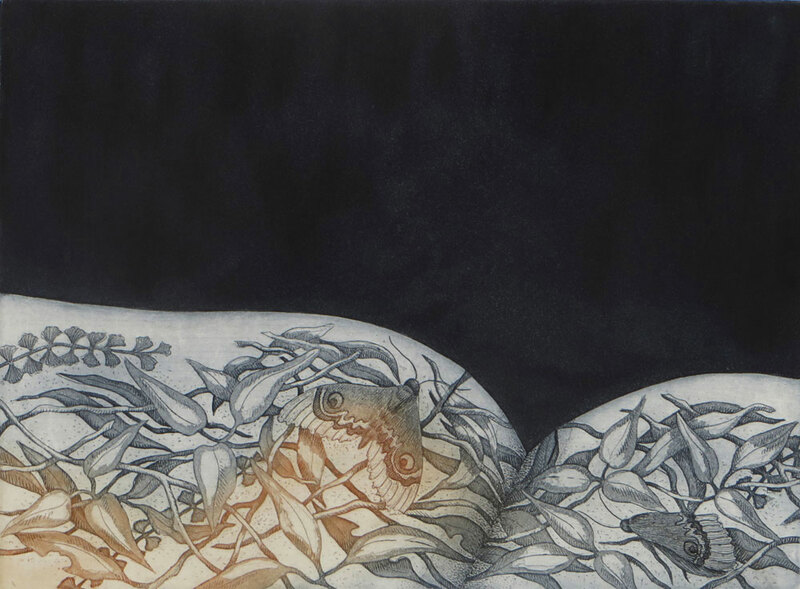 In 2000, 2006 and 2008, Kati was a finalist in the prestigious Silk Cut Award. 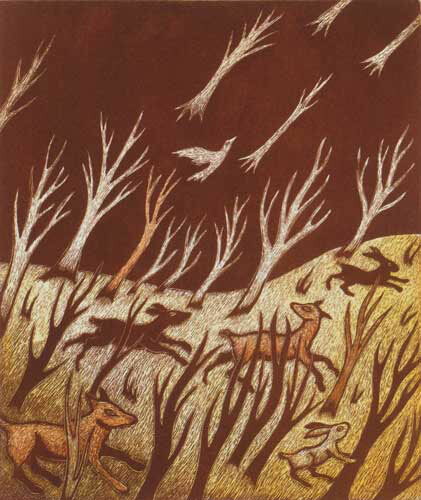 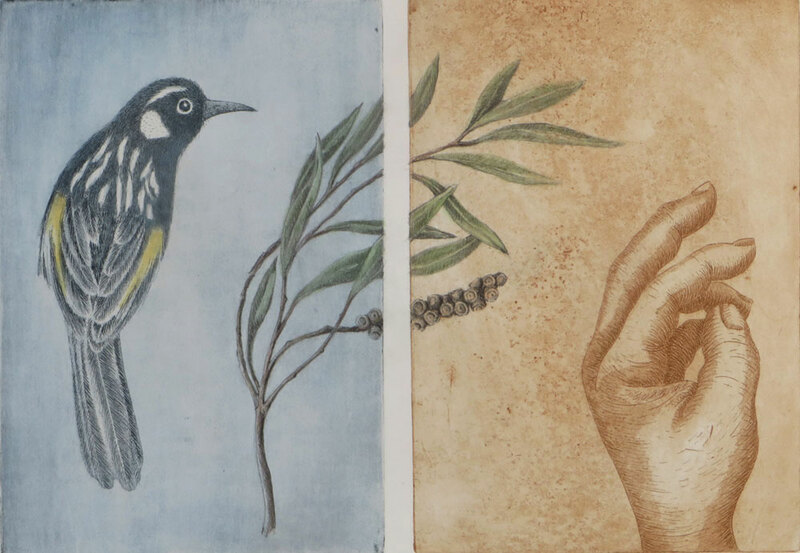 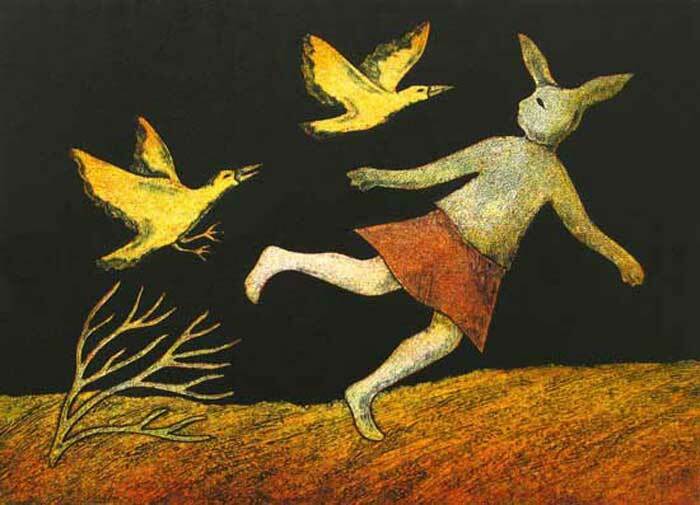 Her work is represented in public collections Australia wide.